Sync digital pictureframes with Mac OS X. Is there a better alternative to FrameLoader? Is FrameLoader really the best app in File Management category? Will FrameLoader work good on macOS 10.13.4? FrameLoader is the first software to synchronize digital pictureframes with Mac OS X. FrameLoader features a one click sync of iPhoto albums, iTunes playlists and custom media files and works with most digital pictureframes, USB memory sticks and memory cards. FrameLoader is an application to take the pain from using digital pictureframes with Mac OS X. FrameLoader offers the missing comfort to sync a digital photoframe with iPhoto albums, iTunes playlists and custom media files. FrameLoader needs a review. Be the first to review this app and get the discussion started! FrameLoader needs a rating. Be the first to rate this app and get the discussion started! 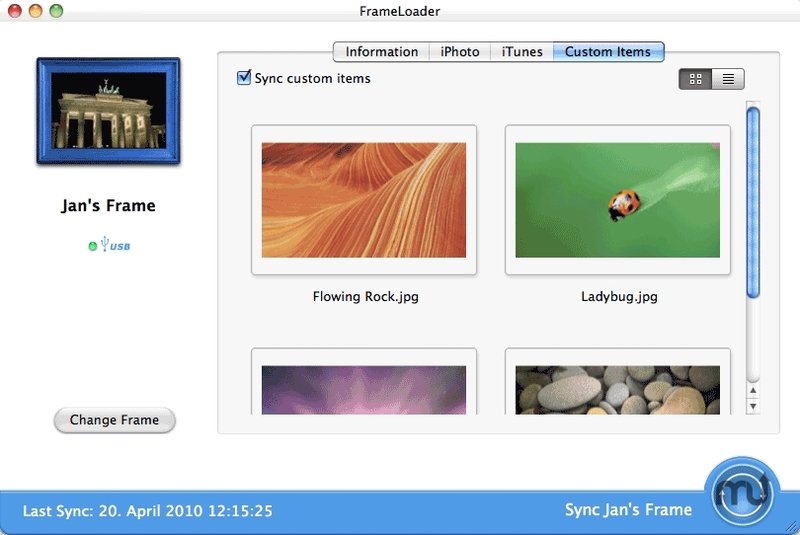 Once setup, FrameLoader features a 'no click needed' sync solution and will synchronise iPhoto albums and iTunes playlists as soon as a digital pictureframe or memory stick/card is connected to the Mac computer. To select the media contents, FrameLoader displays a list of iPhoto albums and iTunes playlists. Custom media files can be dragged and dropped into FrameLoader as well and selected accordingly. A click of the sync button starts the synchronisation process and an activity monitor displays the details of the sychronisation process. FrameLoader features a SyncMonitor to synchronise media files automatically: Once the to-be-synced iPhoto albums and iTunes playlists are selected wihtin FrameLoader, it is not necessary to open FrameLoader again to synchronise the device. A clever SyncMonitor watches for any known frame or memory stick to be connected to the Mac and starts the sync process automatically. So it is possible to change the contents of albums and playlists and have them synced at a later time. FrameLoader offers a high flexibility: FrameLoader supports memory sticks and memory cards. The user can sync the media files to a memory stick or memory card and use it on a TV to e.g. show the latest holiday pictures to the whole family. Sometimes, a digital photoframe is just too far away to conveniently connect it to the Mac computer, so a memory card or memory stick can be used instead. FrameLoader features a teach-in assistant: As soon as a new device is added to FrameLoader, the user can select a custom name for the new device. In addition, this assistant defines how any media file should be converted to be displayed properly.